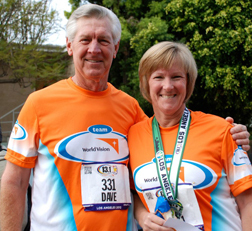 Yesterday, Team World Vision posted an edited version of my mom’s story from the 13.1 L.A. in January. Her full story is even better–she’s a very gifted writer. My mind has been a bit of a jumble this week because on Sunday, this baby will be as old as Kate and Lucy were. Lovely, kind people keep asking how I’m feeling. Physically, that is, and the reality is, this has been an easy ride so far. No nausea, little tired, very itchy. But I don’t trust how I feel. I felt fine last time too. Until I didn’t. And by then it was too late. I plan on training with our 2013 Team for as long as I can. I’ll probably be walking, and when I can’t walk any more, I’ll be the water girl, but it’s just too rich of an experience, as you’ll see in my mom’s words. some 40 years, I wanted to join our team. pregnant. My husband and I were thrilled to become first-time grandparents. good to go. Her health and training remained strong for 5 months. they showed up at the finish line to cheer our team and support World Vision. the emotional pain of our loss. thrive. And the most basic of all is clean water. this race would be a small step toward my own – our own – healing. Learn more about Team World Vision and find a race near you. As I was speaking with Curtis at church last week i realized how close you were in gestation to that of Kate and Lucy and wanted you to know that I pray for you and Curtis to get through this time gentley filled with the goodness and grace of our loving Father in Heaven. you’ve heard the phrase “rainbow baby”, a baby after a loss…a promise after the storm…A Rainbow is God’s promise.